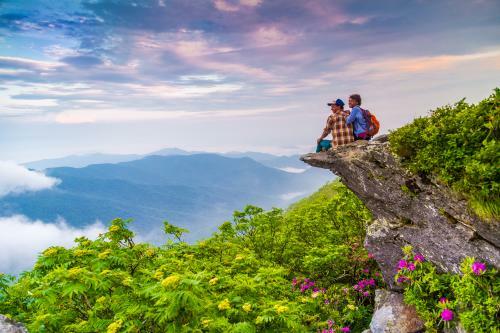 Top Seven Places to View Wildflowers | Asheville, N.C.
See why our mountains create the biggest bouquet of flowers you may ever find. The lush forests and temperate weather of Asheville&apos;s mountains create a mind-boggling kaleidoscope of flowering plants. And many of them cannot be found anywhere else in the world! Here are some of my favorite spots for eye-popping blossoming beauties. Don’t forget your camera. 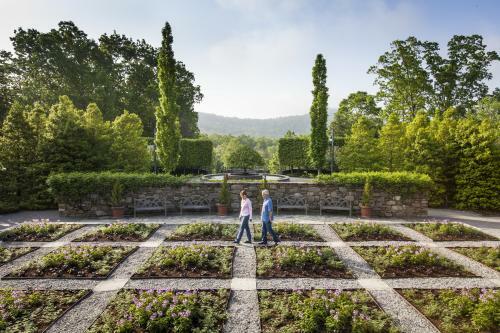 One of the most spectacular gardens in the entire country is found at America’s largest house. The Walled Garden is home to a massive progression of seasonal blooms, along with the rose and butterfly gardens. It’s the place to take selfies that will make your friends jealous. During the wintertime, head inside the Conservatory for exotic blossoms that will transport you to the warm tropics. 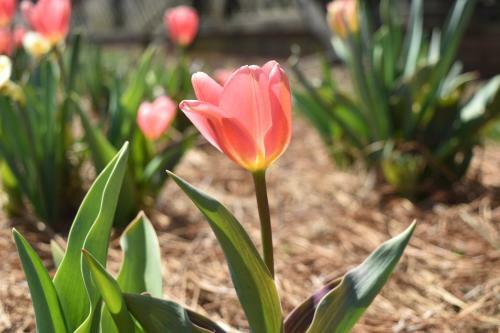 With 65 acres of gardens, you’ll always find a plethora of blooms. Don’t miss the Technicolor Quilt Garden, complete with an observation deck to admire the design. From the tiny blooms on the bonsai trees to the massive native azalea gardens, there are many areas to explore by foot or bike. 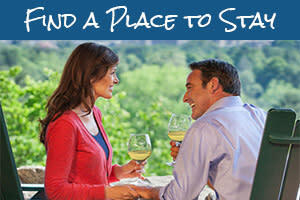 A unique way to tour is via their Art Walk, a self-guided trek to see 35 outdoor sculptures. And you can bring the dog along. See the ultimate in upcycling! This historic highway bridge is now a linear garden that spans one of the most beautiful lakes anywhere. Since opening in late 2013, an army of volunteers continue to add flowers. See clever design elements that will give you lots of fun ideas for your home garden. 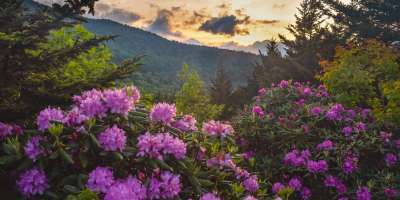 While folks flock to see the spectacular rhododendron displays in June, a short hike at Craggy Gardens along the Blue Ridge Parkway reveals a variety of wildflowers all summer long. Bring a picnic! There are many spots on the mile-high bald summits to spread your blanket amidst the flowers with spectacular mountain views. Just five minutes from downtown, find a hidden oasis with hundreds of native flowers and plants. Stroll the half-mile loop by a stream and historic log cabin to a wildflower cove, with benches along the way. It’s definitely a must for a plant geek, since it’s a refuge to 50+ rare or uncommon species. And it’s free to enjoy. Tucked away behind the historic Omni Grove Park Inn is a garden that is abloom with playful modern sculptures and art created by 13 artists. Be hypnotized by the forest of rotating wind sculptures. After strolling the ivy-bordered pathways, don’t forget to peek inside the impressive gallery! 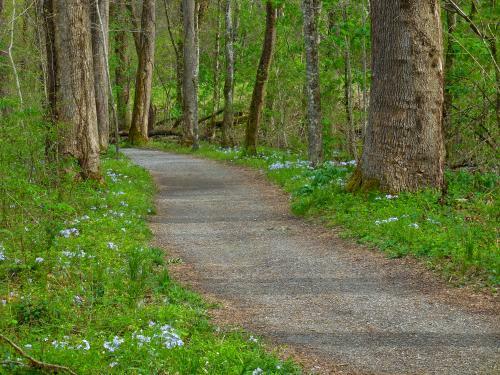 Often referred to as the “Wildflower National Park”, the Great Smokies are home to 1,500 kinds of flowering plants, more than in any other North American national park. 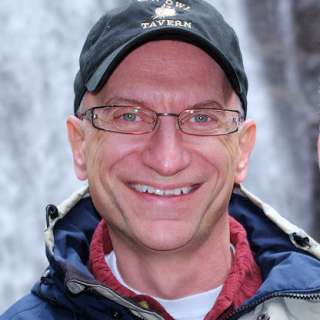 In fact, it’s an International Biosphere Reserve. 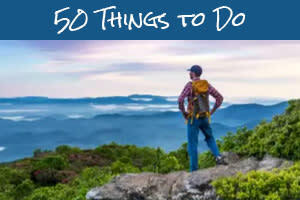 A great way to experience is to take a guided hike with the Friends of the Smokies. 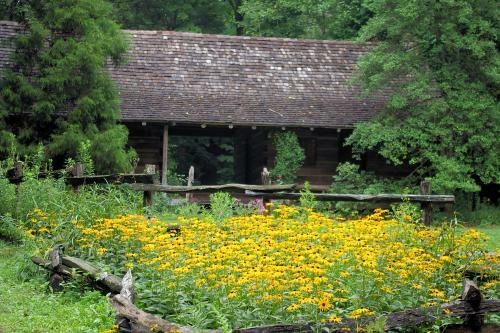 Or visit the Mountain Farm Museum and walk the Oconaluftee River Trail. Top photo by Jason Tarr. N.C. Arboretum quilt garden by Art Meripol. Botanical Gardens of Asheville photo by Mark File. Biltmore tulip and Oconaluftee River Trail photos by Jason Tarr.